Looking for something for your father, for Father's Day or any other special occasion? These cuff links may be just what you're looking for. Made out of stainless steel, these feature a simple but effective design. On each one is the word "DAD" in black enamel, with three black stripes above it. 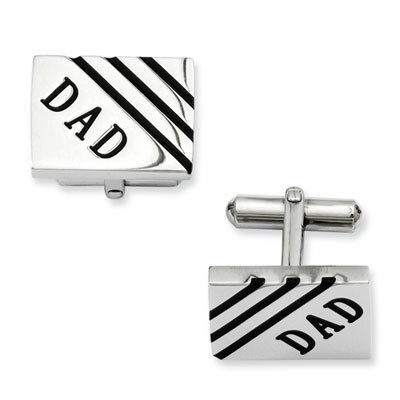 Obviously meant to be given to fathers, the beautiful cuff links will express just how much you appreciate your father for all he's done for you and will continue to do for you in the future. The high polish surface makes it look even better, so that these aren't just novelty pieces; he can wear these as he would any other cuff link, with the added reminder the design provides. Our stainless steel DAD cuff links are enameled for a great look which would be a great gift for any father. Cuff links measure 20mm (13/16") x 15mm (9/16"). We guarantee our Stainless Steel Dad Cuff Links with Black Enamel to be high quality, authentic jewelry, as described above.